It is your challenge today to look deeper into your reflection than ever before and see yourself. Sit for a minute or longer in front of the mirror. If you have a negative thought push it away. Follow the lines on your face. Look at yourself smiling and frowning. Take note of every detail, every single one. These details are what make you uniquely beautiful. Then look at yourself the way you might look at your children. Go now. You have one minute. Come back and share if you’d like. I know I would love to hear your thoughts. Then I want to hear about how #40Faces has influenced the way you see yourself and others. Thanks for all the love and comments. For all the participation—whether you commented or not. I hope this series has inspired you! If it has please take a moment to like bedheadmom on Facebook, share the series or your favorite posts and tweet about it. A special thank you to the all of the beautiful people who volunteered their beautiful faces for this series. It takes a lot of courage to be photographed without makeup. I applaud them for sharing their natural beauty with all of us. 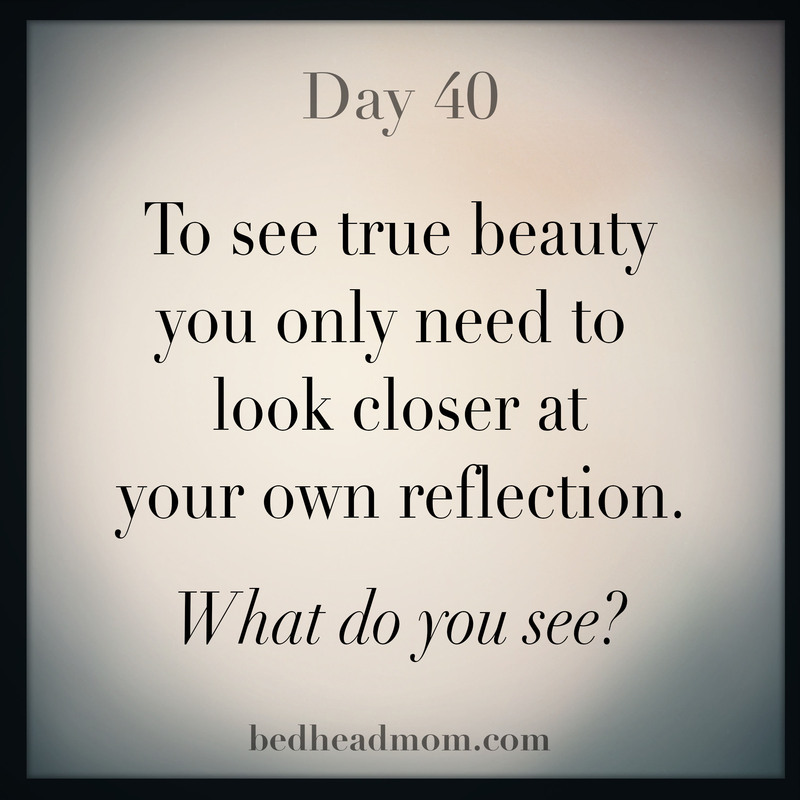 And now, you have me teary, from just reading what you’ve written for Day 40. I think something I gained from looking at all these photos is an appreciation for the little things — the twinkle in the eyes, the slight curl of the beginning of a smile, the furrow in the brow — these are all things that make each of us unique…and I’m grateful you helped us take a look at these women and ourselves. Thanks.